Cuminum cyminum or Cumin Seed Essential Oil is extracted from the distilled dry seeds of the cumin plant. It appears slightly yellowish green to brownish color and soluble in alcohols, essential oils and insoluble in water. Cumin Seed Essential Oil relieves muscular pain and improved digestion. 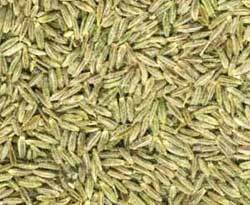 Cumin Seed Oil also checks migraine pain, epilepsy, memory loss and nervous exhaustion. Our Black Cumin Seed Oil is a tonic for the brain and nervous system and promotes cerebral circulation. We are one of the best Cumin Seed Essential Oil Manufacturers and Suppliers.